Senior team member Pierre Marquet adds, "DHM gives precious information not only about the shape of neurons, but also about their dynamics and activity, and the technique creates 3D navigable images and increases the precision from 500 nanometers in traditional microscopes to a scale of 10 nanometers." A good way to understand how DHM works is to imagine a large rock in an ocean of perfectly regular waves. As the waves deform around the rock and come out the other side, they carry information about the rock's shape. This information can be extracted by comparing it to waves that did not smash up against the rock, and an image of the rock can be reconstructed. DHM does this with a laser beam by pointing a single wavelength at an object, collecting the distorted wave on the other side, and comparing it to a reference beam. A computer then numerically reconstructs a 3D image of the object -- in this case neurons -- using an algorithm developed by the authors. In addition, the laser beam travels through the transparent cells and important information about their internal composition is obtained. 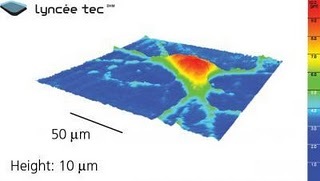 Normally applied to detect minute defects in materials, Magistretti, along with DHM pioneer and EPFL professor in the Advanced Photonics Laboratory, Christian Depeursinge, decided to use DHM for neurobiological applications. In the study, their group induced an electric charge in a culture of neurons using glutamate, the main neurotransmitter in the brain. This charge transfer carries water inside the neurons and changes their optical properties in a way that can be detected only by DHM. Thus, the technique accurately visualizes the electrical activities of hundreds of neurons simultaneously, in real-time, without damaging them with electrodes, which can only record activity from a few neurons at a time. Without the need to introduce dyes or electrodes, DHM can be applied to High Content Screening -- the screening of thousands of new pharmacological molecules. This advance has important ramifications for the discovery of new drugs that combat or prevent neurodegenerative diseases such as Parkinson's and Alzheimer's, since new molecules can be tested more quickly and in greater numbers. "Due to the technique's precision, speed, and lack of invasiveness, it is possible to track minute changes in neuron properties in relation to an applied test drug and allow for a better understanding of what is happening, especially in predicting neuronal death," Magistretti says. "What normally would take 12 hours in the lab can now be done in 15 to 30 minutes, greatly decreasing the time it takes for researchers to know if a drug is effective or not." The promise of this technique for High Content Screening has already resulted in a start-up company at EPFL called LynceeTec (www.lynceetec.com).